In forested areas, students are often intrigued by mysterious sticks covered in carved tunnels–but students often think the patterns were made by human artists or termites. 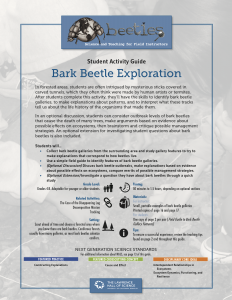 After students complete this activity, they’ll have the skills to identify bark beetle galleries, to make explanations about the patterns of beetle galleries, and to interpret what these tracks tell us about the life history of the organisms that made them. In an optional discussion, students can consider outbreak levels of bark beetles that cause the death of many trees, make arguments based on evidence about possible effects on ecosystems, then brainstorm and critique possible management strategies. An optional extension for investigating student questions about bark beetles is also included. Collect bark beetle galleries from the surrounding area and study gallery features to try to make explanations that correspond to how beetles live. Use a simple field guide to identify features of bark beetle galleries. (Optional Discussion) Discuss bark beetle outbreaks, make explanations based on evidence about possible effects on ecosystems, compare merits of possible management strategies. (Optional Extension) Investigate a question they have about bark beetles through a quick study.